After my fourth time visiting Japan, I finally got the landscape photo I always wanted that I feel encompasses everything that I love about Japan in a single shot. 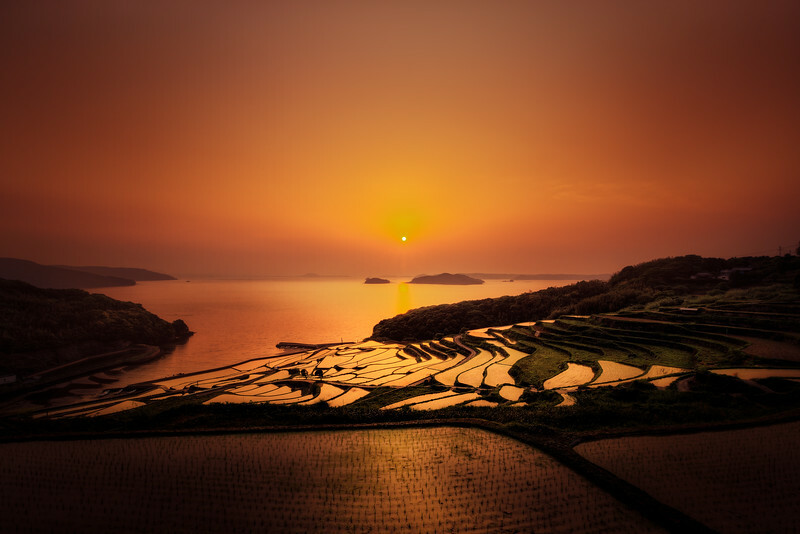 The golden sunset over the Island filled seas with the rice field terraces in the foreground. The icing on the cake and my favorite thing that was going on while shooting this scene was this goat that was wondering the fields just screaming like an angry old man, completely destroying the tranquility of what was in front of me. It was hilarious and awesome and you would never know looking at this print. I took this landscape photo in Saga Japan between 6:30-7:00pm It was a three shot HDR exposure. I used the Sony A7r with the metabones adapter and the Canon 16-35mm II lens. Software used was just Photomatix, Lightroom and Photoshop with Nik's Dfine 2 to remove some noise. A lot of dodging and burning and some saturation control. That's it. What's incredible is the final Tiff file ended up being 1.5GB. Doing HDR photography with that 36 megapixel sensor on the Sony A7r will just eat your hard drive alive. Which is why lately I've been shooting a lot of street photography in APS-C mode with that Zeiss 35mm lens. It's kind of ghetto but also helps crop past the edges of that lens which are piss poor.